In the interests of making this web space a lively, interesting place for you to come (or peruse via RSS) I will shamelessly try on this gimmick for size. As the wife and I have a two-year old in residence – and are deeply committed to the written word – we read a lot of kids’ books. As I know that several of my half dozen or so readers are also parents I shall hope to offer a useful recommendation each Monday1 for all you folk out there in the parenting/reading trenches. Our hero, of course, is unconcerned as it would certainly be impossible for his parents to arrange delivery of “the largest animal in the world, ever” to his humble abode. As as you may guess, his parents pull off just such a feat3. Hilarity ensues, including the requisite schoolyard ostracism and some clever use of physical humor that depend largely on matters of scale – trying to fit the whale in the classroom, playing in the park with his pet whale, trying to gather 10,000 gallons of seawater at feeding time, etc. And it’s all fun and games until somebody gets stuck in the blowhole. I won’t spoil the ending but it is cute, and relies on the physical juxtaposition of the world’s largest mammal with the everyday details of modern suburban life. Ultimately, this is probably a little old for a two-year old, but Zeke seems to enjoy it. As a parent it’s nice to find a book with a good sense of humor that throws some things in for adults. 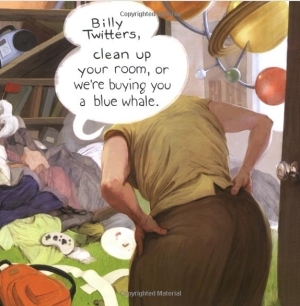 Billy Twitters and His Blue Whale Problem is one of those great books that entertains both child and adult. Zeke likes the pictures of the whale, and I like the quirky story line and the subtle touches such as having another child on the playground swinging with a giant squid as if just anyone might happen to have ocean-dwelling pets as a commonplace of life. In short, this one is worth the purchase4 and will most likely grow with your child from early toddler right on through intermediate reader.